Yesterday we did girly, today, we're going on safari. Leopard print is always an easy go to, even zebra. But what about giraffe? Yep, you heard me, that not so graceful, awkward and gangly animal that has a fantastic big print. Not sold? How about we ease you into it with some jewelry? How cute is this? A little blingy, a lot unique. Perfect for layering. OK, you can pay $99 for a similar bracelet here or $12 for this one. Sweet, simple, easy, and quirky. 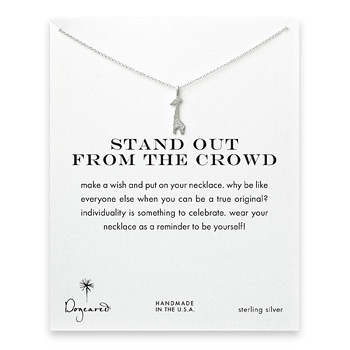 This tiny pendant is a great gift or a great add on for your weekend outfit. See? Giraffes are sweet! They're lovely creatures so why not try them? Also, fun fact, giraffes sleep approximately 30 minutes per day. You're welcome. I love Giraffes! I think I need to add the Dogeared necklace to my closet! Ooh I think giraffes are so sweet! Love all these but especially that darling ring! 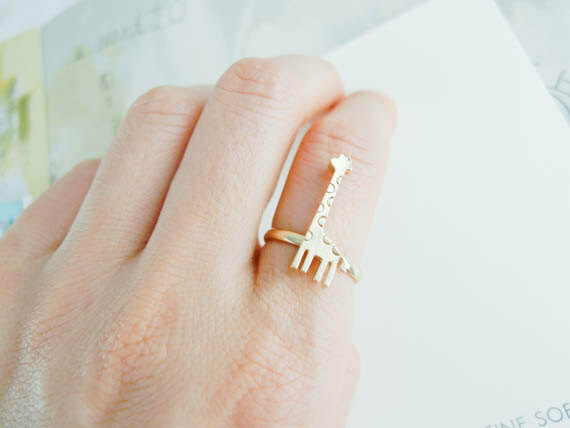 That giraffe ring is so cute (and original! )!